A Set of 10 Tips for Soldering Station 936 or Quakko 700Your best source for reliable DC Power Supply, call us at 408-622-9851 for product questions and ordering. 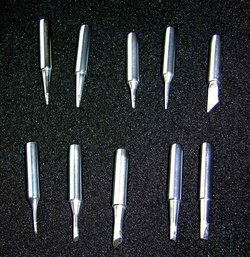 For sale is a set of 10 tips that's compaptible with any Quakko soldering stations or Rework stations. These tips are also compatible with any Hakko products.